Here are some Simple tips to getting the best life out of your tree! Note: When first put into water a Christmas tree can drink 1 to 4 liters of water in the first day! Easy, top loading slot to hold 3/8" steel nuts. No Break polypropylene has great strength and is unaffected by low temperatures. Heavy wall and rib construction ensures strength and stability. Reinforced screw holes allows optional attachment to 3/4" plywood base for mounting. Elevated stand centre never touches floor prevents "rocking" for increased stability as well as condensation. Three tempered steel, rust proof spikes keep tree from shifting or twisting. Easy set up, easy take down. 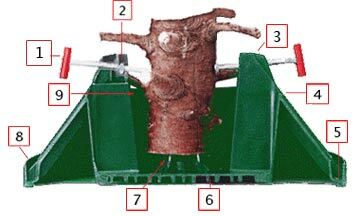 Low and wide, easy to fill reservoir requires only 4" clear trunk, saving low branches for a fuller, more beautiful tree. Four sizes hold 3/4 to 3 gallons of water. Custom 3/8" steel bolts are above waterline (no rust) and angled to clamp and hold the tree securely. Snap on plastic handles and screw on steel caps provide easy tightening. You are more than welcome after Christmas to return your tree for recycling. Just pop the tree over the gate entrance for collection.